The Jones family embraced the Gospel in England when the children were very young. 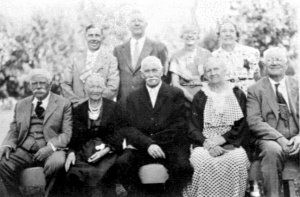 Grandfather Jones, after having heard the Mormon story from some missionaries, became very impressed, and desirous of hearing more. He took his children to a meeting called by the missionaries, to hear more about the revealed religion. As they were returning to their home, Grandfather stopped by a big tree. He told the children to walk on, while he knelt at the base of the tree, and there he offered a prayer to the Lord asking that he might know if this new religion was true. He must surely have received his answer, because the family was all baptized into the Church except Mary Jane and baby George, who were too young at the time. Mary Jane Jones Richins was born on June 5, 1858 at Nettleton, Gloucestershire, England, and was a daughter and the third child of Robert Jones and Harriet Tipper Jones. Harriet Tipper already had a little five-year-old daughter when she and Robert were married. Her name was Ellen. Harriet Jones was very sick for quite a long time after the birth of her baby, George. The baby died while quite young, and Harriet died on November 12, 1865, of consumption and was buried in the Cowley Church Yard Cemetery. Before Harriet died, she and Robert, desirous that Ellen should marry in the Church, decided to send her to America with some of the missionaries and immigrants. She came over in 1861. Robert and his children talked often of that sad parting when Ellen left her sick mother. In April 1866, Robert Jones and his three children, Allen, William, and Mary Jane, left Nettleton, England for Liverpool to come to America. They set sail on April 30, 1866on the ship “John Bright.” For nearly six tiresome weeks they were on the sea. Mary Jane had her eighth birthday while coming to America. They finally landed in New York on June 6, laid over at Castle Gardens a few days, then traveled by way of New Haven, Montreal, then to Detroit and Chicago and to St. Joseph, Missouri. They sailed the Missouri River in a boat to Wyoming, landing on June 19, and camped there for several days. Mary Jane was baptized in a stream (Sweetwater) that empties into the Missouri River, on July 7, 1866, by Steven Alec and she was confirmed by W.W. Ritter. The Company, headed by Captain Chipman, left Wyoming on July 13, traveling with ox teams over the plains. Robert Jones had a very hard, trying time caring for his small children while making the long journey. Since Mary Jane was the youngest, she was permitted to ride part of the way on the wagon, even though the wagons were heavily loaded. They all walked most of the way behind the wagon, Mary Jane holding to her father’s hand. Later, she often told of the times her father would carry her across the streams, and how she would lift up her feet so as not to get them wet as he carried her. She especially mentioned the time their company crossed and camped by the Platte River in Wyoming. The names and dates of many of the early immigrants are now engraved in the rock hill where the road crosses at that point. Captain Chipman would always call the Saints together in the evenings to have prayer and sometimes to dance and sing before retiring. Robert was taken sick with mountain fever while en route, and lay in the wagon for several days. This made it hard for him with three children to care for, but Mary Jane never forgot how her father would gather his children around him for prayers at night. It was a source of strength to her all her life. While coming up the Platte River, they saw herds of buffalo coming from the hills to the river for water. The dust and mosquitoes were terrible. One of the teamsters swam the river in order to find a place for all the wagons to cross. After crossing the river, they camped for several days so the people could wash their clothes and clean up. When the Company reached Echo, Utah, they were met by Edward Richins and Thomas Stevens and wife (Robert’s sister). The Jones family made their home with Edward Richins all winter. Edward was married to their sister, Ellen. Ellen had given birth to a baby boy who had died. On December 3, 1866, she gave birth to another boy, named Alma Ether. But Ellen became very sick and passed away about two months later on February 16, 1867. She was buried in Henefer, Utah. Robert and his family continued to reside at the Edward Richins home until Robert married Miriam Richins. Then they moved to a city lot in Henefer in 1868, and here Mary Jane went to school. 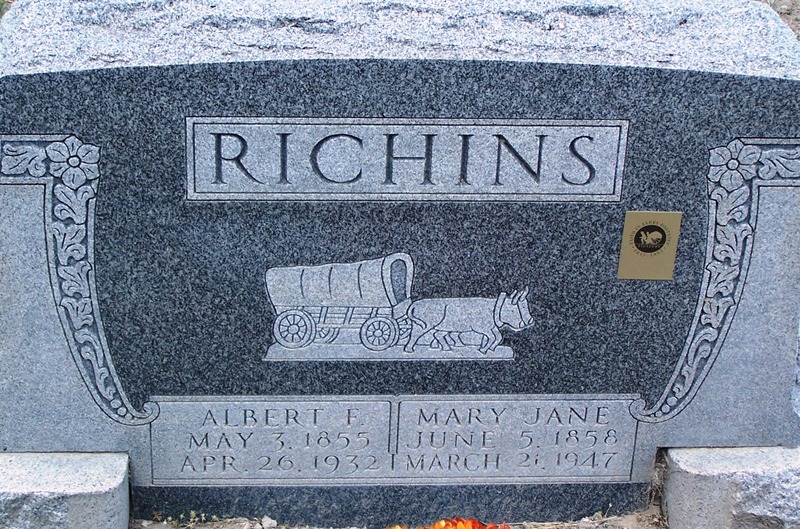 Mary Jane was only sixteen years old when she and Albert F. Richins were married. Albert was nineteen years old. They went to Salt Lake City with Sandy Glenn, who was taking a load of grain to sell. The load was heavy and they had to walk part of the way, especially up the hills. 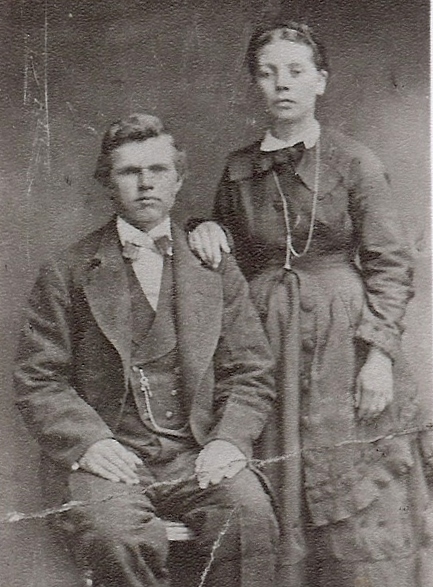 They were married the day after they arrived in Salt Lake City in the Endowment House on November 16, 1874. They returned to Henefer and lived in the home of William Betteridge (who had gone away to find work). Their first child, a boy, Albert Sidney, was born on August 8, 1875, but died a week later of prematurity. Being hard for young couples to make a living and buy land in Henefer at that time, it was very promising for them when an article appeared in an issue of the Deseret News, which told of the possibilities in the Grouse Creek Valley. So after investigating the situation, it was decided that five young couples from Henefer would move out there to begin to establish their future homes. The trials of pioneering that country were many, and filled with disappointment and discouragement, but they worked well together, and as the years wore on, their settlement became a very prosperous and thriving community. The five men made the first trip to the Grouse Creek Valley in northwest Utah to look the country over. They were impressed with what they found and the possibilities there. They returned to Henefer to make preparations to move their families. On May 24, 1877, Albert and his wife Jane and one child, together with James Simpson and wife and child, left Henefer for Grouse Creek, arriving June 10. They all traveled in the same wagon, taking with them all the provisions they could possibly carry. A box of chickens was tied on the back of the wagon and a milk cow belonging to James Simpson was led from the wagon, with the calf riding inside the wagon. They had plenty of troubles in making their journey, including being forced to sell the chickens and having trouble with rainstorms. Their wagon broke down at Uintah, which delayed them three days. At Locomotive Springs, they stopped for the night, turned their oxen to graze and the oxen strayed away. It took a day or two to find them. They had become mixed with another bunch of cattle some distance away. Upon their arrival in the Grouse Creek Valley, they made a dugout in the side of the hill about where the old Mecham place now is. Here both the families lived together until they could get logs to build houses. They slept on their wagon box. Albert had taken up his land at the mouth of what is now known as Cook’s Canyon. So the following spring, he built a cabin on his property, and moved his family there in the spring of 1878. The following October, they all returned to Grouse Creek with their families, and found the Richins and Simpson families were quite well. They had run low on food, however, and they had been forced to live on stinging nettle greens, with an occasional treat of rabbit meat. Father (Albert) had taken with him an old gun which he used to kill the rabbits or grouse to help out with the food, but he ran out of bullets for the gun. So Mother (Jane) melted one of their lead spoons, and she made a bullet for Father’s gun so that he could kill a rabbit or grouse to eat. If he was lucky, they would have meat to go with their greens for their meals. A lady on the West Creek (Etna) gave Mother a chicken hen which she staked out by her door and scared the coyotes away with her broom. The hen laid an egg every day which she fed to her little girl, Eliza. There were a few settlers already living on the West Creek, now known as Etna. Mother did hand sewing for some of them, and earned enough to buy a little flour that fall. Mother said that in the spring of 1878, when the settlers had bought seed grain from Ogden to plant, she took the empty sacks and sewed them together, and made a covering for her dirt floor so it would be warmer for her little girl to play on. She staked it to the dirt floor with wooden pegs driven into the ground. She did wash for sheep herders, so that she could get money to buy the first wooden floor she ever had. In the fall of 1878, Father and William Paskett went to Ogden for flour. Mother, being alone with her little girl, became aware in the middle of the night that her third child was about to be born. So she took Eliza and walked about two miles to the home of James and Ellen Simpson. When she got there, they got out of their bed, stirred it up a little and let Mother have it. George was born there before morning. When Father came back, Mother and the children were back home and waiting for him. Mother worked very hard all her life and had many trying times while she was raising her large family. She did not have the respect from Father that she should have had. He was a stern, strict man at times and made many demands of her and the children. She raised lots of turkeys every year as well as some chickens and also had a few cows of her own, so she had her own bank account (in a different bank than Father’s), thus having her own money to spend as she desired. Mother had her share of sickness to care for. With no doctor to call, they depended on each other and the Lord to help them. The women would attend each other in the delivering of their babies and during times of sickness and epidemics. They used many home remedies in their care of the sick but depended mostly on the Priesthood. When a death occurred, the Relief Society women would help the brethren in preparing the dead for burial. Mother gave birth to a total of thirteen sons and daughters. The first, Sidney, died in infancy as previously mentioned. Later, they lost a 17-year-old daughter, Louisa, with typhoid fever. She passed away onOctober 11, 1899. At the time of her death, Mother was expecting Orita, so she went back over to the old log house across the creek for the birth so the baby wouldn’t be exposed to typhoid fever. Their nine-year-old son, Ether, took sick with the dreaded disease on the day of Louie’s funeral, and was critically ill for three months. Annie spent much time with Ether, teaching him to talk and walk all over again after his recovery. Three sons served as missionaries for the Church: George went to Australia, Wilford to the Dakotas, and Alma to England. When World War I broke out, Grouse Creek was called on to send their share of young men. Ether and Wellie were among those who were called to go. Mother worried a lot while they were gone to war. She spent many sleepless nights while Ether was overseas in the midst of the fighting, and also when Wellie lay sick for weeks with influenza at Camp Lewis, Washington. Shortly after their return, she suffered a sun stroke and she lay near death for weeks with a high fever and was sometimes delirious. She lost all her hair at this time, but when she got well, her brown hair came back in again and didn’t turn grey until she got quite old. On December 24, 1925, Wilford’s wife, Lillian, died following childbirth, and Mother took the baby girl, Leola, to raise, She was then sixty-seven years old but she enjoyed good health, and took care of Leola until Leola married. She lived in the Midland Hotel in Tremonton one winter while Leola attended high school there. Mother lived fifteen years after Father passed away, and took care of herself until a year before she died in 1947 when she had a stroke that left her mind affected and it was quite impossible to communicate with her. She spoke a few words, but did not comprehend enough to carry on a conversation. She would sit in her old rocking chair for hours, day after day, being unable to read or visit with anyone, and also unable to dress or take care of herself. 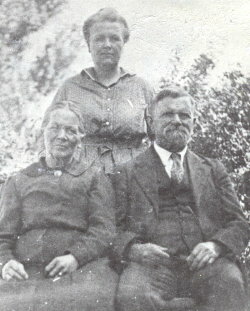 Newell and Jennie Richins moved into the north part of her house to be closer to her and they took care of her at night. Jennie carried her meals to her. Orita and I took turns taking care of her during the daytime until she passed away on March 21, 1947. Wellie was with her when the end finally came. Orita and I washed and prepared her lifeless body for the trip by car to the mortician’s waiting plane which took her body to Brigham City for burial preparations. Her small toil-worn body bore evidence of many years of hard work. I am thankful to have had the privilege of helping to care for her in her old age. Her posterity numbered more than 150 when she died. God bless her memory. She was buried in the Grouse Creek Cemetery.